It is with a bit of sadness that I have to give up being the perfect age for a Douglas Adams fan tomorrow but this past year has been a fun one. I’ve had a chance to meet a lot of people by going to a couple of conventions and I would not trade those experiences for anything! To those of you that I’ve met by doing the blog and being on Twitter – I’m so happy to have been able to share some of my quirks and enthusiasm for reading with you. You’ve given me a lot of assistance over the year and I hope that the changes that I’ve made to the blog reflect this advice well. You cannot know how much I appreciate kind words and encouragement! The giveaways this week have been fun to do and I hope you have been enjoying them as much as I’ve enjoyed doing them. To the incredible publishers who have been so generous with me over the past year on the blog – I cannot thank you enough for granting me access to the titles you have been so generous with! If not for you I wouldn’t be exposed to as many new authors and subject matter that I’ve been able to be as my book budget isn’t that forgiving. I can’t tell you how much I’ve appreciated everything you’ve done for me and I hold a special place in my heart for the press that was the first one to consistently give me access to titles (Love ya AJ!!). I’m looking forward to expanding the site as I bring more contributors online and hope to expand my relationships with you over this next year! To the incredible authors who have been willing to send this small start-up blog books for review and make guest appearances – Thank you for giving me a chance to review your work and I hope that I have done your time and effort justice even if the title didn’t work for me. I strive to be fair and balanced in my reviews of your work while still being honest as to how I feel. I understand it takes time and effort to create these works so I try to make the same effort when I review your work. While I might not always like everything that crosses my path I still appreciate everything you did to create it and I hope that we can continue to work together during this next year. I’m so happy to have met a few of you at conventions this year and look forward to meeting more of you over the next year! I can’t wait to see some of you again at RT in New Orleans!!! I am going to have 2 winners. Both will be getting a towel (will make sense once you read the books) and 2 Big Bang Theory plastic Bazinga cups. I will be giving away one hardcover compendium (shown in photo) and one eBook version of the series. To enter all you have to do is comment (even if it is just to say Hi!) but here is the important part – You MUST tell me which version of the books you would like to be entered for. If it doesn’t matter which one please state this but I really need to know this. I will choose the winners on September 18, 2013 so please have all entries in before 11:59 pm on September 17, 2013. I haven’t read this series as yet so either (print/digital) would be fine with me. Happy Birthday, Stephanie and thanks for the giveaway. I prefer the digital version. Happy, happy, happy birthday, Stephanie! 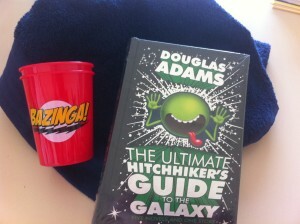 LOVE the tie-in with Hitchhiker’s Guide! As you know, I would prefer the hardcover!